The floating face seal is a vital part of your travel motor or final drive, whether its on a John Deere skid steer or an ASV compact track loader. It rests against the hub, holding in the gear oil on the planetary side and preventing contaminants from getting in where they can damage bearings and gear. If this seal begins to leak, your travel drive motor will suffer damage. In this Shop Talk Blog post, we are going to talk about 5 things you should know about floating face seals and track drive maintenance. The floating face seal goes by a several different names, including duo-cone seal, dual-cone seal, toric ring, mechanical face seal, or main seal. The assembly of a floating face seal is made up of two matching halves. 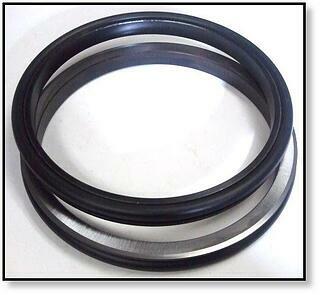 Each half has a seal ring and toric elastomeric ring, which acts as a secondary sealing element. One face of the seal ring has been precision ground/lapped to mate with the matching face on the opposite seal ring. The elastomeric ring forces the two seals halves together, thus providing the seal. The floating face seal has been designed to survive in some of the most extreme conditions encountered with construction equipment and earth-moving equipment. 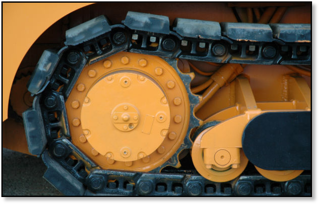 However, keep in mind that floating face seals have a limited life span and are supposed to be replaced during the life of your equipment, whether its an ASV drive motor or a CAT hydraulic motor. That life span can be extended by carefully cleaning out debris from around the face seal using a hose or pressure washer. That same life span can be drastically reduced by allowing abrasive contaminants to get packed in tightly around the face seal by not cleaning your machine and, if applicable, the undercarriage. A leak behind the sprocket means that the floating face seal is no longer able to achieve a tight seal. Not only can gear oil leak out, allowing damage and corrosion to the planetary side of your final drive, but abrasive material can now make its way inside your final drive. All the mud, sand, concrete, silt, dirt, cement, dust, sludge, and other debris that build up in the undercarriage and around your final drive now has access to the precision gears and bearings in your travel motor. Those contaminants mix with the gear oil and form a thick and often smelly sludge. That sludge does the opposite of lubrication -- allowing excessive heat, abrasion, erosion, scarring, scratching, gouging, and metal-to-metal contact to occur until your final drive no longer functions. We have already discussed the fact that floating face seals have a limited life span. One cause of failure is that the seal has simply exceeded the number of hours it was rated for and needs to be replaced with a new seal. 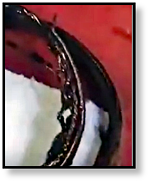 Another more common cause is that the seal was offset because of exposure to contaminants – or, in other words, so much debris got packed in and around the outside of the face seal that it displaced the seal. This process begins with damage to the o-ring until it is weakened to the point that it no longer forces the seal faces together tightly. The o-ring shown here was damaged to the point that it looks shredded. This is obviously not good. Once that happens, debris gets in between the seal faces and things simply get worse form there. The contaminants begin to mix with the gear oil (that hasn't leak out) and form a damaging sludge. To prevent premature failure of your face seals, clean the undercarriage of your machine with a pressure washer. This simple maintenance step can save you thousands of dollars in repairs. 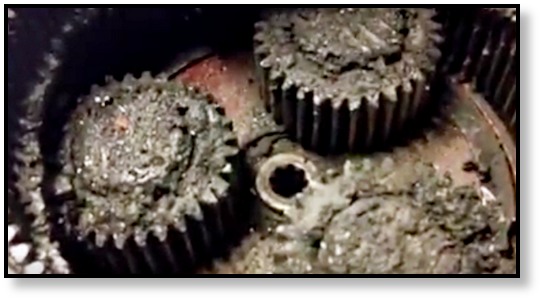 If it seems that you are having to top off the gear oil too often or you notice gear oil leaking behind the sprocket, that means you have a problem with your seals and it is time for them to be replaced. The sooner you attend to such leaks, the more money you will save. Never take your face seals for granted. A failed main seal can destroy a final drive beyond repair, and that can happen very quickly. Keep your ASV compact track loader, CAT multi-terrain loader, or CAT mini-excavator undercarriage clean and attend to leaks quickly! Remember, face seals aren't meant to last forever but their life can be extended as long as possible through proper maintenance. When it comes time to fix a final drive, remember that the face seal may need to be replaced. Hydraulic drive motors are Texas Final Drive's area of expertise providing best-in-class new and reman final drive motors. What differentiates Texas Final Drive is our quality, our service and our warranties that gives us the distinction of being best-in-class. Check out our latest reman final drive hydraulic motor inventory for ASV Compact Track Loaders or look up your manufacturer brand final drive.